In the early twentieth century, a group of artists, writers, and intellectuals called the Bloomsbury Group came together in England. They were people who understood that any intelligent person benefitted from the perspective many thinkers from many disciplines. We take our lead from them. This show and our voices are just the beginning of the conversation, however. It continues in collaboration with the audience, those people who come to the dA Center for Cultural Arts and meet with us. We’re here to hear your voices. After moths of organizing students at Garey High School in Pomona, a pilgrimage was held in honor of Cesar Chavez. It stared with a blessing of a 300 year old tree led by Chief Eagle. As the community proceeded in chants promoting peace, equality, and education, Chief Eagle dropped an Eagle feather, Dr. Calderon picked it up and gave it back to Eagle. 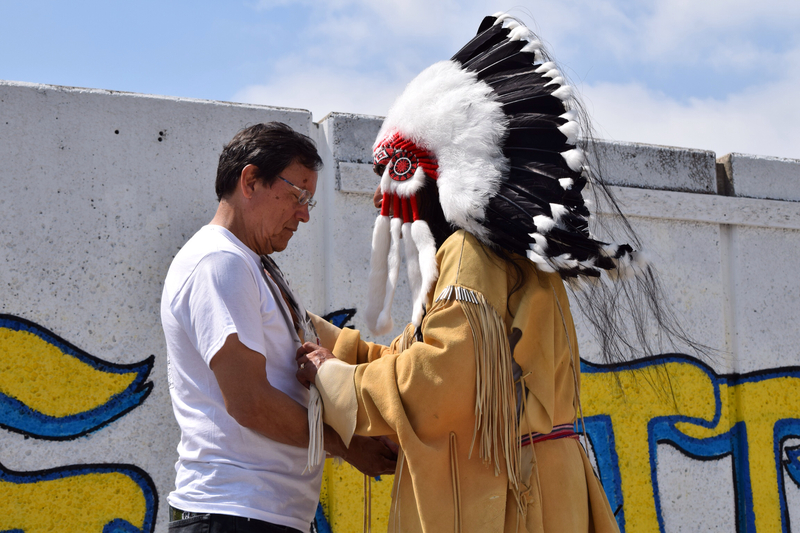 Chief Eagle later shared a sacred moment with the community by honoring Dr. Calderon through the gifting of the Eagle feather which is the highest honor one can receive in indigenous cultures. Chief Eagle blessed Dr. Calderon telling him the feather he picked up was his elders saying his work and wisdom in the community earned him respect from all.